The Disney Store has free in-store events that are perfect for children of all ages. These are fun events that usually involve costumes, stories, music, and games that your children will love. 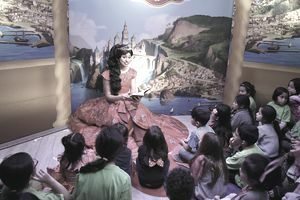 The types of free events at the Disney Store in the past have included costume parades, story times, sing-alongs, games, movie viewings, and craft activities. Sometimes there are also big Disney Store events that involve character appearances, celebrity guests, artist signings, and even free gifts. Each Disney Store event is usually based around a theme that's holiday, seasonal, or Disney related. Visit the Disney Store Locator website and click on your local Disney Store on the right side of the map. Scroll down to see upcoming free events at your local store as well as any sales or new items they have available. Here you'll see the details of the free event including the date, time, minimum age, and what type of free event will be taking place. No registration is required for the Disney Store free events, just show up at your local Disney Store at the designated time to participate. Sometimes the free events at the Disney Store are on a first-come, first-served basis. Make sure to get there at the beginning of an event, especially if something free is being given away in addition to the activities. The Disney Store free events for kids usually take place on Friday, Saturdays, or Sundays, and start at various times depending on the event. Be sure to check with your local store to make sure you have the right time and day for the event you want to attend. The free events at the Disney Stores don't happen on a regular basis; you'll have to check their upcoming event calendar on a regular basis. You can also follow their Facebook page to make sure you find out about the latest event. You can expect for there to be an event to promote a new Disney movie hitting the theater, a new movie release to DVD, a grand opening of a new Disney store, or a seasonal event to celebrate a holiday or certain time of year. The Disney Store has a few fun activities that happen every single day at the Disney Store, and I bet your kids will love them. When the Disney Store opens each day, there's a daily opening ceremony, and there's also a Disney theater where they can spend time watching Disney films, trailers, and music. Crazy about Disney? You can find out how to get free Disney movies and how to collect Disney Reward codes to get free Disney goodies. If your child loves these free Disney Store events, they'll also enjoy free events at Toys R Us and Pottery Barn, free crafting activities at Michaels, Lakeshore Learning, free mini model builds at Lego Stores, and free kids' building classes from Lowe's and Home Depot.